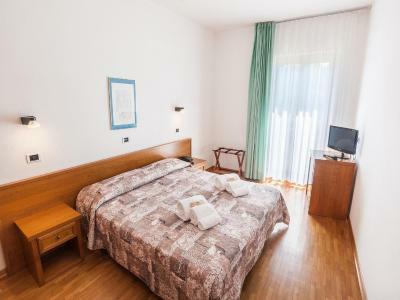 Lock in a great price for Hotel Palazzuolo – rated 8.4 by recent guests! The common areas of the hotel had some style (e.g. fireplaces, books). It wasn't just the standard modern construction. The restaurant was very good and there was ample, convenient parking for bicycles. they offered us to re-book at another date without penalty because the initial booking was not refundable and we had to cancel it. Excellent breakfast. Comfortable room. The location and view are great! Beautiful pool! Helpful friendly staff! Very nice rooms. Very clean. The staff is really nice. Verry nice place, great pool, great view. Great location to see the area. The room was perfect and our view from the balcony was the beautiful Tuscan countryside. The pool was incredible and the breakfast was tremendous! Fluffy scrambled eggs, croissants, cereal, everything anyone could want. We had wished we booked multiple nights. We discovered the quant downtown area the morning we had to leave. I liked the room. The shower was great as it was very hot there! The pool was wonderful. Good location pool was nice and plenty of seats around it within walking distance of small town. Very spacious, generous longe areas. Room and bathroom ok, about right for the price. 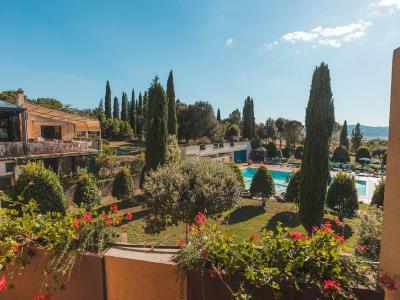 Good location in the heart of Tuscany, close to nice locations. Easy parking is possible on site. Breakfast buffet was ok except cold eggs. Beds comfortable, ample hot water for showering, decent breakfast, great jumping off point for all kinds of day trips. 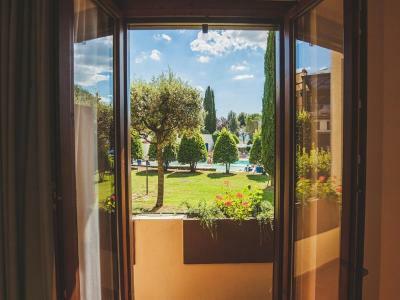 Hotel Palazzuolo This rating is a reflection of how the property compares to the industry standard when it comes to price, facilities and services available. It's based on a self-evaluation by the property. Use this rating to help choose your stay! 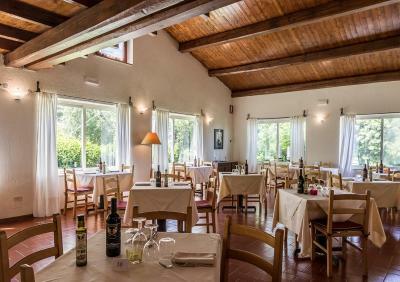 One of our top picks in San Quirico dʼOrcia.Offering a Tuscan restaurant and an outdoor pool, Hotel Palazzuolo is located in San Quirico d’Orcia, 15 mi from Montepulciano. Set in tree-lined gardens, it has air-conditioned rooms with satellite TV. Some rooms at the Palazzuolo have a balcony with views of the Val d’Orcia. All come with free Wi-Fi, a private bathroom and mini-bar. A daily buffet breakfast is provided. The restaurant is open every day and specializes in local dishes. A children's playground area is also available. 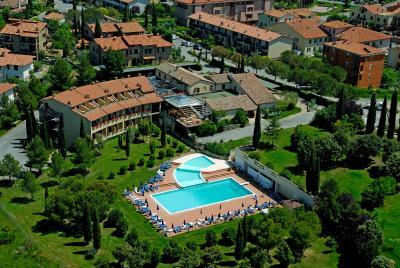 The village of Bagno Vignoni, with its thermal springs, is 3.7 mi from the hotel. 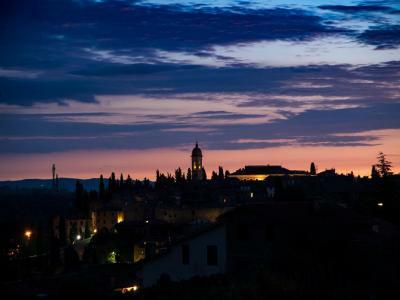 Montalcino is 9.3 mi away, and parking is free at the Palazzuolo Hotel. 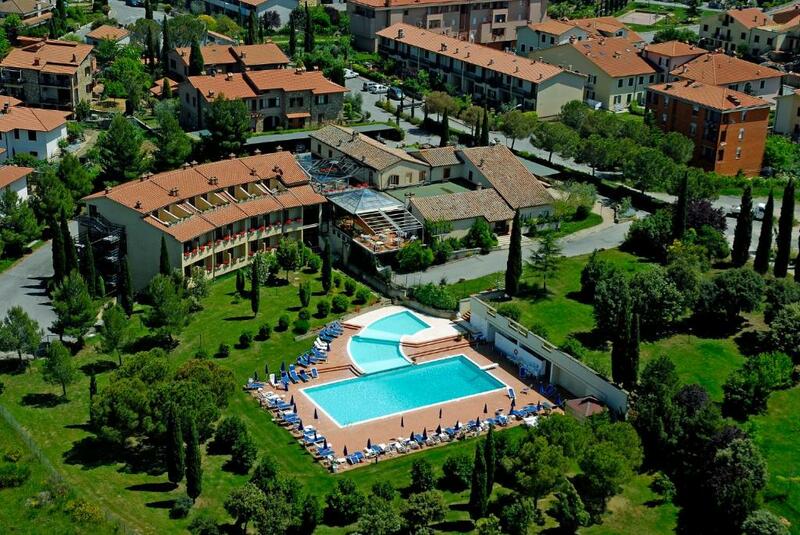 When would you like to stay at Hotel Palazzuolo? 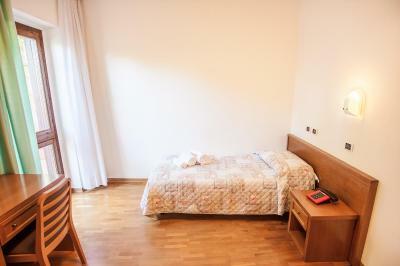 This larger room features free Wi-Fi, air conditioning, and a satellite TV. 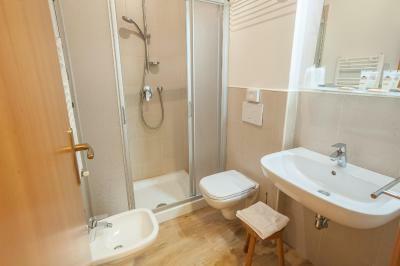 Private bathroom is complete with toiletries and a hairdryer. 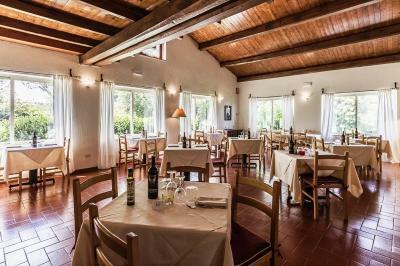 Some rooms offer views of the Val d'Orcia valley. This room features free Wi-Fi, air conditioning, and a satellite TV. Private bathroom is complete with toiletries and a hairdryer. 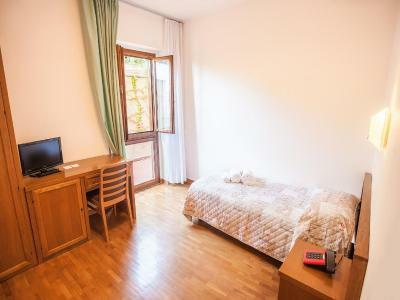 This air-conditioned room features a satellite TV, free Wi-Fi and a private bathroom with a hairdryer and free toiletries. House Rules Hotel Palazzuolo takes special requests – add in the next step! Hotel Palazzuolo accepts these cards and reserves the right to temporarily hold an amount prior to arrival. Good location, friendly staff, we were a bit early in the season, but all was as expected. Clean, pleasant and friendly staff. There was no decoration in the rooms whatsoever. A bit of color would have helped a lot. The front desk staff were not friendly. At reception they could have been more cordial. I am used to a friendlier welcome. No hot food(eggs) at breakfast. Automatic Coffee machine doesn't produce good coffee. If you are standing the view from the balcony is gorgeous. The housekeeping and breakfast staff are very friendly and efficient. The walks on the property are wonderful. Very dog friendly place. The hotel is spotless and there are lovely plants everywhere. There is a tea kettle in the room, too. There are lots of cozy corners to sit in, indoors and outdoors. The jam, yoghurt, and croissant at breakfast are very good. I would stay there again. Dinner was quite expensive for the quality. I wish we had a "daily menu" option to introduce the very well-known tuscany cuisine. The staff is nice. Breakfast was great! We had dinner in the hotel, that must be booked in advance, since there are not quite a lot options around. 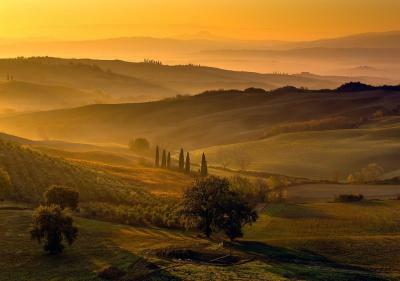 The view in the balcony of the room was right to the fields, the classic views of Tuscany. We didn't had the opportunity to use the pool, but it seemed clean and nice. Nothing i dislike, but car is essential. Very comfortable hotel. Good base to explore Tuscany by car. The bed and pillows were very uncomfortable. All furniture are old and overused. Balcony and the view from the balcony were very nice. Nice, clean hotel. Perfect breakfast with wonderful selection, we also recommend to order dinner in the hotel restaurant, meal was very tasty. It is close to the centre, there is also the option to rent bikes without edditional fees. The locatin is perfect for making trips to nice Tuscany countryside (walk or bike). The pool was great. 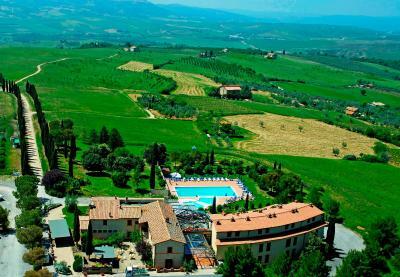 The Hotel is fantastic to enjoy Tuscany. The whole hotel is incredible and nothing to be better. The attention of the crew, the restaurant and parking made our stay special. If you want to rest a week in Tuscany I highly recommend to stay in Palazzuolo. 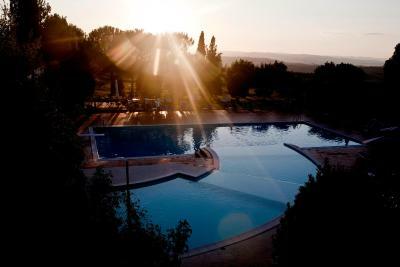 Incredible sunset in the pool and you can enjoy it during the hot summer. Breakfast was until 10AM which is no problem, but they started clearing the buffet and tables a little bit earlier which made you feel you needed to hurry. Shower head was dirty and needed replacement. View from our room (room 329, 2nd level). Bicycles that you could take for free (even at night) to go to the village for dinner/drinks. Village and supermarket is only 5 minutes away. It was not possible to visit the restaurant after arrival at 20. 30 o' clock. Beds were not so comfortable. The light of the room and especially the bathroom was dark and when took a shower, the floor was so wet. Besides, it’s easier to open the window outside so be careful of your belongings. There is a swimming pool there, suddenly we were told to take the swimming cap otherwise we can’t be in the pool. How many percentage of tourists will bring swimming cap during their trips?